Ticks Vs Bed Bugs – What Are The Differences? Bed Bugs Vs Ticks - What Differences Are There? Knowing how to identify and treat bed bugs and other pests is a growing problem for homeowners, especially with the rise in bed bug outbreaks. Fortunately, however, you don’t have to suffer with unwanted pests, and the first step to getting rid of them is knowing precisely what kind of infestation you’re dealing with. That’s what you’ll learn about in this article. Specifically, you’ll learn how to tell the difference in ticks vs bed bugs. You’ll also find out what each of these pests look like. You’ll even discover how to distinguish tick bites from bed bug bites, so you can make an identification even if you didn’t see which pest left the bite. Let’s jump into the information that will set you straight on ticks vs bed bugs. First of all, ticks and bed bugs are not particularly similar to one another compared to other insects. In fact, ticks are not even insects, which bed bugs are. Ticks are arachnids, like spiders and mites. In fact, ticks are a type of mite. Being arachnids means they have eight legs rather than six, and they do not have antennae. Ticks survive on blood alone. It is essential to their growth and life cycle. Specific species of ticks prefer particular hosts for feeding. Only a few species of ticks prefer human hosts, and most of those also feed from other animals as well. 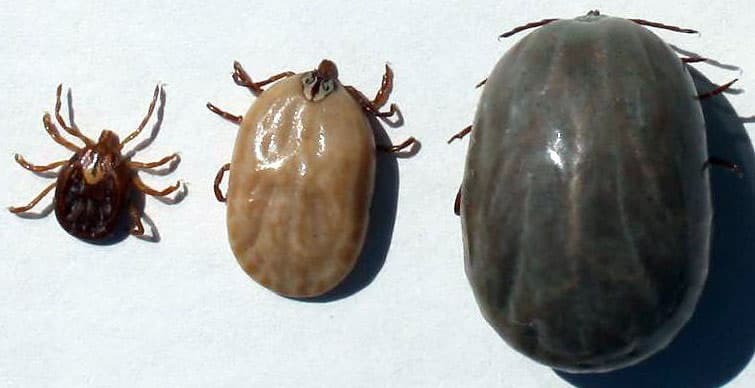 There is no species of tick that only feeds from humans, but in general each species of tick tends to feed only from the types of animals it is accustomed to, with a few exceptions, like the deer tick that feeds from nearly anything with blood. Some ticks prefer mammals. Some prefer birds. Some ticks even prefer reptiles and amphibians. The good thing about this is that you don’t need to worry about all ticks, only the ones that might feed on you or your pets. How often do ticks eat? Because there are so many different varieties of tick, there is no one answer about their feeding patterns. Generally though, ticks do not feed often, and they certainly do not feed every day. In fact, some ticks feed only about three times in their entire life cycle before reproducing and dying. In contrast to ticks, bed bugs are insects. They have only six legs, and they do have antennae, as well as vestigial wing pads. They cannot, however, fly with these wing pads. Bed bugs are a specific species of insect, so the patterns of bed bug behavior are easier to define than those of ticks. Like ticks, bed bugs not only eat blood, it is essential for their life cycle and ability to grow through each stage from nymph to adult. Bed bugs must have a blood meal at least five times before they can become reproducing adults. 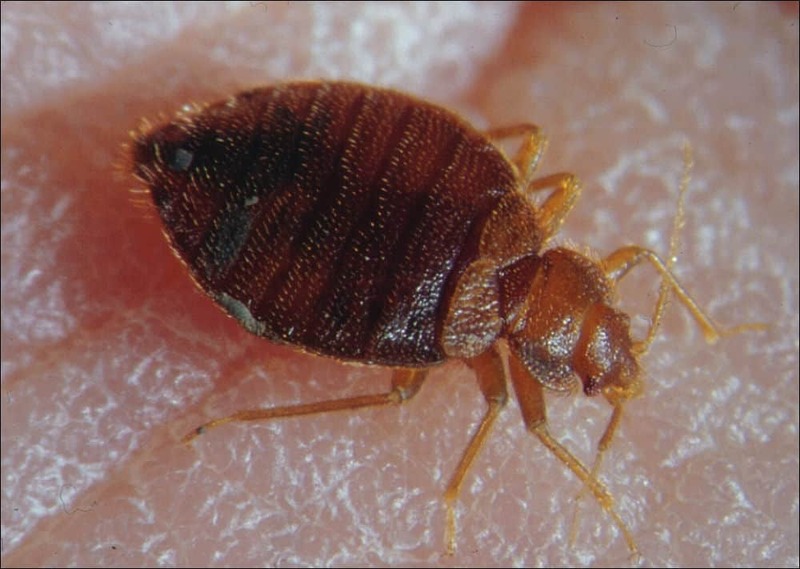 One of the reasons why bed bug infestations take root in people’s homes is that bed bugs have adapted to have a distinct preference for human blood. Whereas ticks will feed from many different types of animals, bed bugs are less likely to do so. It is possible for bed bugs to feed on other species, but in general they do not. This may be because humans simply make easy hosts for bed bugs, which have difficulty crawling through fur or feathers. We also tend to make predictable targets, sitting still for long periods of time and sleeping in the same spot each night. How often do bed bugs eat? Bed bugs can also go long periods in between feedings. A typical bed bug lifespan is only about four to six months. That being said, in cold conditions they can live for more than a year, even without food. What is certain is that bed bugs must eat before each new stage in the life cycle, and each bed bug goes through five molting stages before reaching adulthood. After reaching adulthood, the bed bug may feed again, but individual bed bugs do not feed every day. As mentioned, many different species of ticks exist. Each species looks slightly different from the others, so in order to identify ticks on yourself and your pets, you need to know which ticks to look out for and what the specific types of ticks look like. Here are the most common ticks that you may encounter on people and pets. Deer ticks are hard ticks that look flat and oval shaped. Their bodies fill up as they eat, but not as quickly as soft ticks, which have leathery skin that stretches easier. Soft ticks tend not to feed on humans or pets, so you’re less likely to see these varieties. Dog ticks are also hard ticks that look like a flat seed, similar to deer ticks. There are American dog ticks, also called wood ticks, and brown dog ticks. American dog ticks are reddish-brown, and adult females of a large silver spot behind their head. Male American dog ticks look much different from females and have thin silver lines on their backs. American dog ticks will feed on humans and pets. Brown dog ticks are not commonly found on humans. Lone star ticks are another hard tick. The adult females can be identified by a small white spot on their backs. There are also many other common types of ticks. Proper tick identification is difficult. Not only does each species look different from others, but individuals of a single species also look different in the various stages of their life cycle. If you catch a tick, you can send it in for testing to find out if it’s a variety that is likely to carry disease. It’s understandable that bed bugs could be mistaken for ticks, which is why bed bug identification is so important. 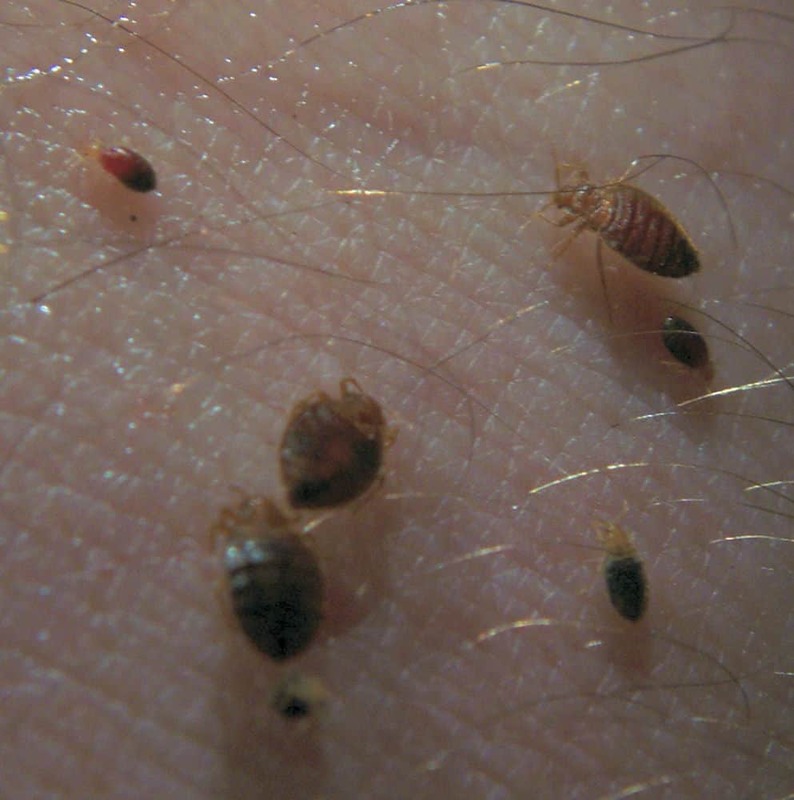 Bed Bugs also appear flat and reddish brown, like some species of tick when they have not fed. Up close, bed bugs and ticks have distinct differences, including a different number of legs. Unlike ticks, bed bugs are more likely to be found indoors in cracks and crevices. After feeding, adult bed bugs will look elongated and engorged, more like a cylinder than the flat oval shape they are when unfed. Bed bug nymphs are often a lighter color and can be somewhat translucent, making them even more difficult to see than the adults. Bed bugs are not known to spread diseases to humans. The appearance of bite marks can be one of the best ways to tell the difference between tick bites and bed bug bites. You’re much more likely to actually catch a tick in the act of feeding than you are to catch a bed bug, as they can latch on and feed for up to 10 days if left undisturbed. If you see a small bloodsucker attached, or if you see their head embedded in your skin, then you know you are dealing with a tick. Bed bugs do not attach in this way to feed, and they only feed for a maximum of a few minutes before crawling back to a hiding place. If left alone when feeding, ticks can grow many times their original size. Ticks can also be rather difficult to remove once they begin feeding, and caution should be taken to ensure they are removed properly so that no part of the tick is ripped off remains embedded in the flesh during the extraction process. 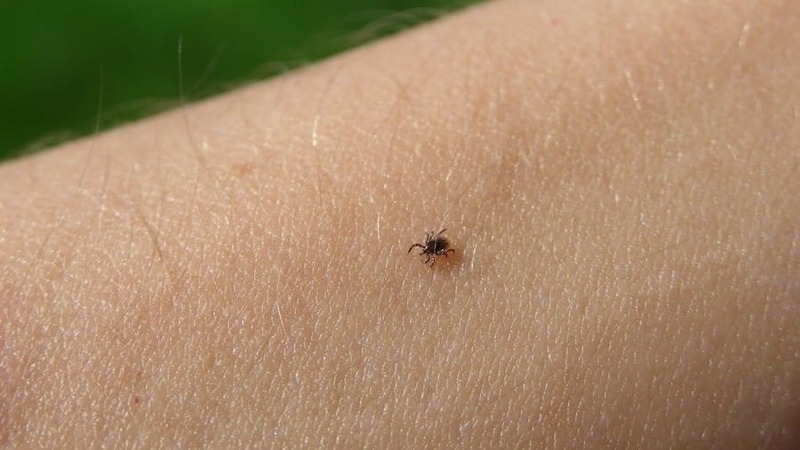 Additionally, ticks are more likely to bite while you’re active during the day, which makes it more likely that you will see them on the site of the bite. 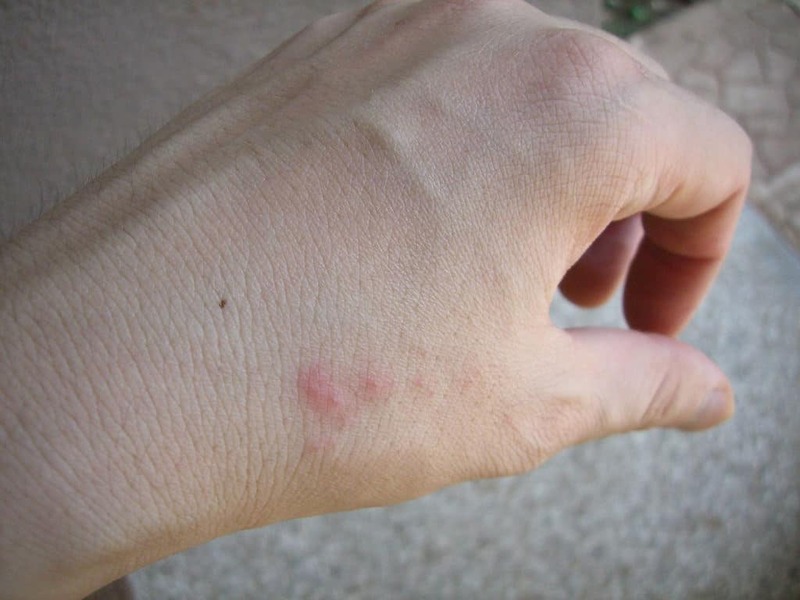 If you don’t catch the tick in the act, the bite will be difficult to identify because it looks like a reddened spot of skin, much like other insect bites. Ticks tend to bite in places that are warm and moist. Common bite areas include between the toes, on the groin, in the armpit, or behind the ear. Just because the bite is not in one of these places, however, does not mean it’s not from a tick. Also, tick bites tend to occur as a single spot, unless you had multiple ticks attached at once. If you have been bitten with a tick carrying Lyme disease, you will likely develop a bullseye shaped rash around the site of the bite. This particular rash develops in about 80 percent of Lyme disease cases. Bed bug bites also look like red spots on the skin. However, bed bugs feed in a different way from ticks, making patterns that are less likely to be found from other pests. Whereas a tick attaches to one site and feeds for potentially many days, a bed bug does not embed itself into your skin. It will feed in a location and then move along and bite in a different place if slightly disturbed. Because of this behavior, bed bug bites often form rows of linear bites. Both ticks and bed bugs are difficult to spot. They are small and their bites tend to go unnoticed until marks appear later. One of the primary ways to tell the difference is where you see the pest. Ticks are more likely to be picked up outdoors during the day or come into your home on a pet. Bed bugs, on the other hand, are more likely to be found indoors where humans sleep or sit for long periods of time.